How to plan the perfect House Warming Party. A behind the scene look. A few weeks ago, I was fortunate enough to pair up with SunTrust Mortgage. to help plan a Housewarming Party. The party was for a lucky couple that just bought their very first home. And even more exciting than that, it was all caught on video!! More on that in a bit… but I thought it would be fun to see a little Behind-the-Scenes of what really goes into creating a video shoot like this. My role was to help bring their style to life in the form of an outdoor get together. A housewarming party where they could invite some of their closest friends and family and introduce their new home. When planning any party I like to take into account the couple’s style and vibe. Are they formal? Casual? Do they like color? Or should we keep the space neutral? 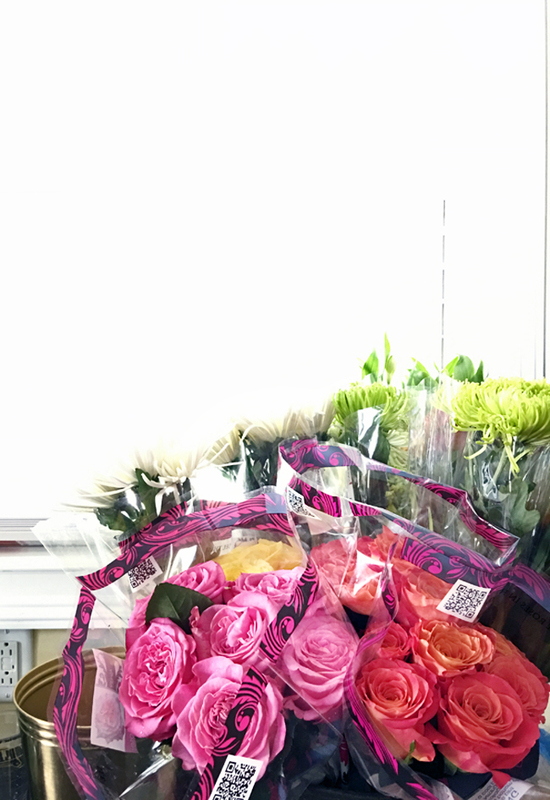 I wholeheartedly believe that a housewarming should reflect the space and complement the couple with maybe a little extra pop of color or pattern. It is a party after all. In this case, the couple (who were only married a month ago!) bought a beautiful farmhouse outside of Charleston. This immediately told me two things… Southern and Casual. Two of my favorite descriptors being a Southern girl myself. Picnic tables, outdoor string lights and flowers were going to be included!! 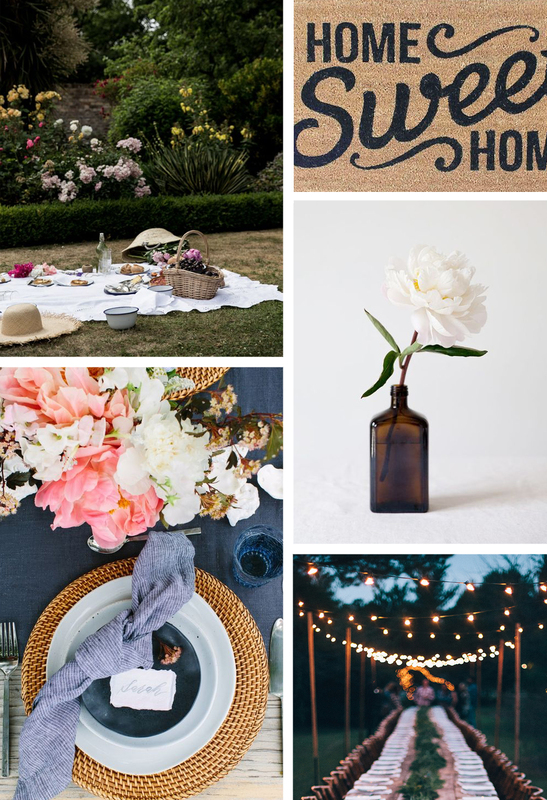 Here are a few inspiration images that got the party design rolling. And if you would like to see some more, here is a link to my Pinterest board as well! Now pulling a party together at home is one thing, but pulling a party together in a different state is another. And then add on a location you have never been to as well as making it look great on camera, well… you get the idea. The day before filming we walked around the house to determine the best location for the party. And like most well laid plans, our initial location ended up not working out. So we changed the entire party layout and switched the party to the front of the home. The front you might ask?! Unexpected, yes. But in this case, the home sits on a couple of acres with no neighbors in sight. 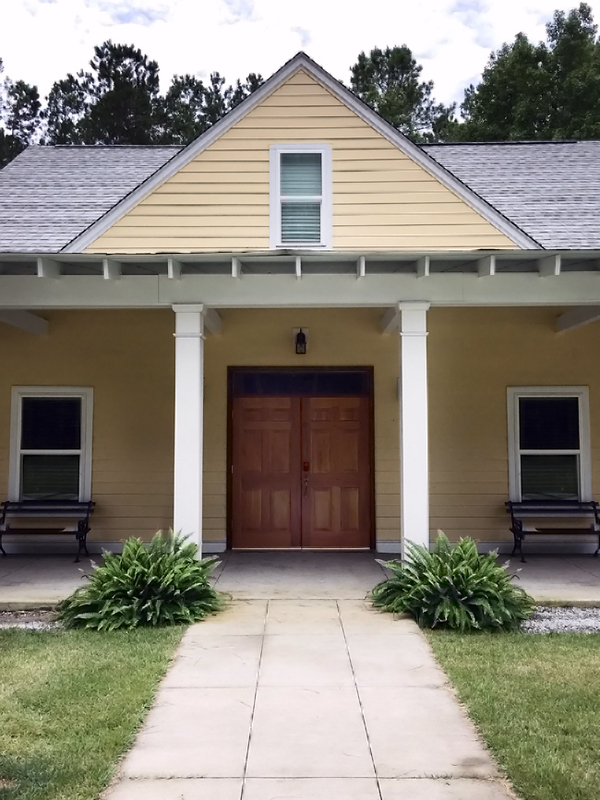 I loved the idea of the guests arriving down the couple’s long gravel driveway and then entering straight into the party, showcasing the front of their beautiful new home. But before actually pulling the party together, we tackled a few DIY projects. One of which was painting their front doors. They didn’t love the honey tones of the wood and wanted something a little fresher to welcome their guests. I just love this shot of the couple working to get the doors ready. It is awfully handy to have a husband that tall! The other project involves a doghouse. And I am going to leave it at that for right now. Because the final results are kind of amazing! So while the front door was being painted and the secret doghouse was coming together, the major issue was the string lights! Since we had moved the party to the front of the house there was nowhere to attach the lights. Now in the “real world” we could have set things up differently, but our location also had a lot to do with camera angles and where the sun would be positioned during the shoot. The one true lighting source you cannot control! 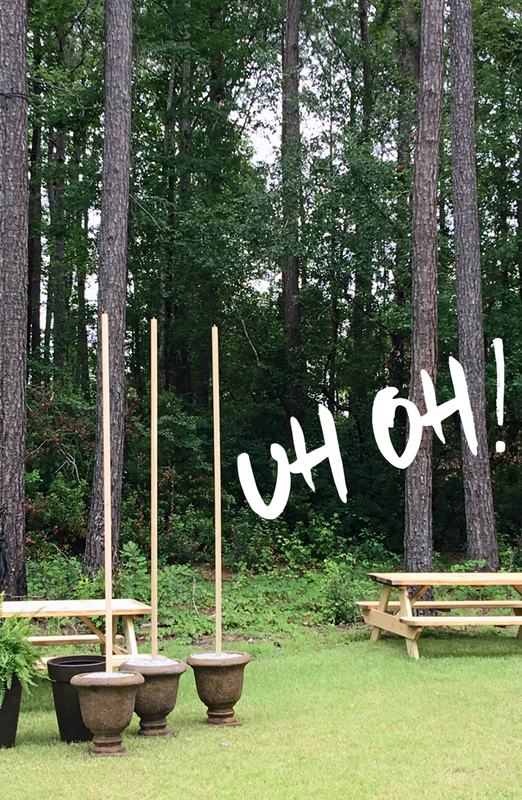 So we fabricated some poles in planters to act as stands for the lights… or so we tried. Being about 45 minutes outside of Charleston in a small town with only one caution light, we were unable to find any quick set concrete. So we had to use gravel instead which was not ideal… Fortunately, there were a number of lighting guys on hand that were able to string some rope about 40′ out to some trees. They were then able to secure the lights making them appear (on camera at least!) that they were suspended from the poles we created. The “magic” aka trickery of filming. Lol. Now it was time to pull the actual party together. When I learned that the housewarming party would have sixteen guests for a sit down dinner, the first issue was where are they all going to sit?! Not everyone has seating on the ready for that amount of people. And especially not newlyweds who just purchased their first house! So I wanted to incorporate something that they would be able to utilize after the party as they continue to entertain in the future. I chose to incorporate two picnic tables that we placed together to create one long table. 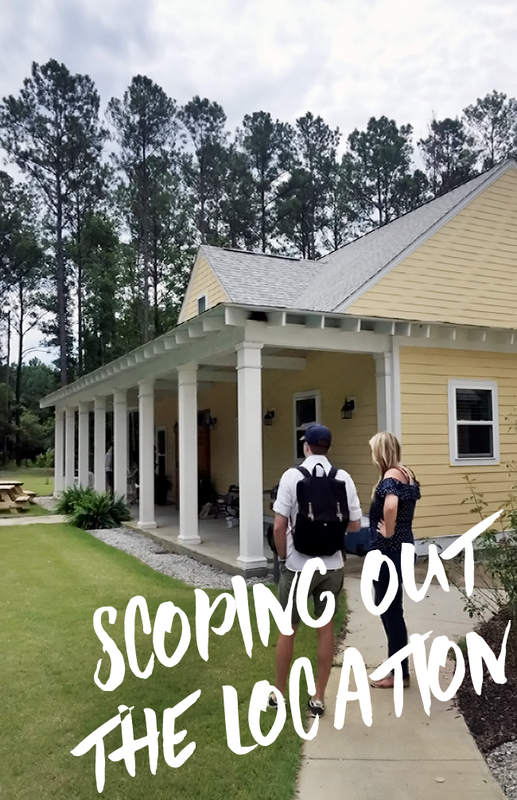 It really pulled together both the farmhouse and Southern goals I was trying to achieve and they are completely practical for the future as well. I also wanted the table settings to be beautiful (obviously) but again, practical for the future. So instead of paper plates and napkins, we opted to use real place settings that they could add to their new and empty cabinets. Another unexpected choice were the dinner napkins I chose. Rather than using classic linen napkins, I opted to get thin dish towels. They looked beautiful for the event, but afterwards they become something that can be used on the day to day. So for the most part, the only non practical items were the flowers. But the flowers! They are always one of my favorite parts. 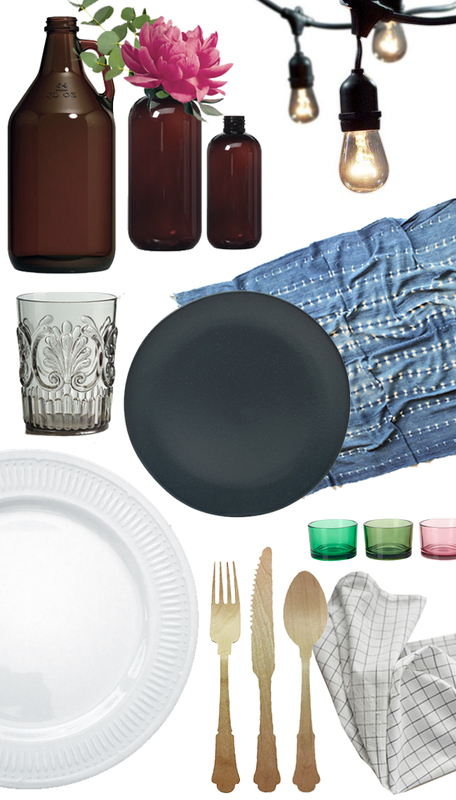 Here are the items that I used to create the table setting. I cannot wait to show you how the party turned out!! 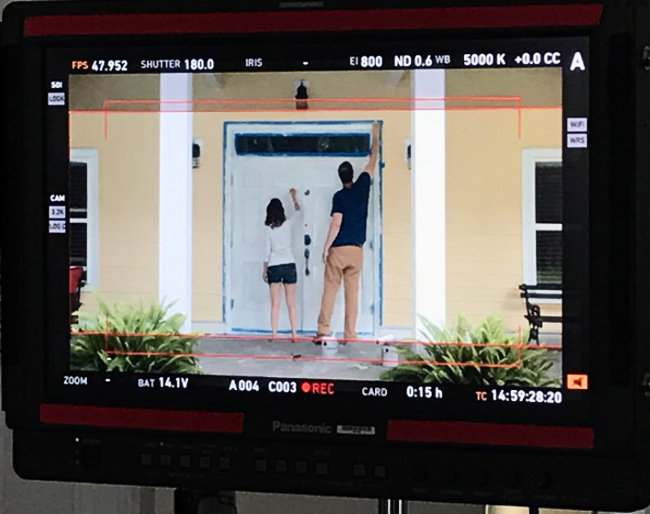 Be sure to check back in for the final party reveal and of course the video we did for SunTrust Mortgage! I absolutely loved helping this couple turn their new house into their new home.